The Family Crisis Center of Walker, Dade, Catoosa & Chattooga Counties will hold its annual mystery dinner fundraiser event on Saturday, March 30. The center, which offers shelter and support for women and child victims of domestic violence, holds various fundraising events throughout each year, but none bigger than the dinner show event. "This is the Family Crisis Center's fifth annual mystery dinner," said Center Director Kristy Lawson. "The year's theme is 'A Night of Comedy,' and we have found this to be a great event for the center." Generally, the event presents an interactive mystery show full of audience involvement, singing, dancing, and sketch comedy. "We love being able to change the theme up each year so that it's always something a little different," Lawson said. "We want this to be a fun night with a lot of laughter." As is the case each year, the cast will be comprised of community members, leaders, elected officials, and members of law enforcement. Philip Schofield with CTI Engineers (left) and County Attorney Clifton "Skip" Patty discuss plans for Ringgold's courthouse streetscape project during the Feb. 19 Board of Commissioner's meeting. Current plans for the city of Ringgold's courthouse streetscape project. Catoosa County commissioners are on board with the city of Ringgold's plan to do a streetscape project around the courthouse on Nashville Street. During the Feb. 19 Board of Commissioner's meeting, officials discussed the planned project that was introduced by the Ringgold City Council back in November. County Attorney Clifton "Skip" Patty said the project has been discussed for years, but that it's now officially in the works. "The city of Ringgold would like to design around the courthouse; a part of this particular project would be to remove the location of the gas pumping station at the courthouse, which has been approved since the 2004 SPLOST, but nothing has been done with it," Patty said. "We would end up taking out the tank there, comply with EPD rules on it, and then the roads beside the courthouse are going to be one way streets." When Ringgold presented the first plans, City Councilman Randall Franks explained that the project is aimed at not only moving the gas pumps, but also creating more parking, new crosswalks, and helping traffic congestion. "This will make a tremendous improvement in the traffic flow around the courthouse," Franks said on Nov. 12. "We'll be adding additional parking on all of these streets around the courthouse, with a tremendous amount of additional parking on Jail Street, as well as along Lafayette Street and on Maple Street." The parking along Nashville Street (U.S. Highway 41) would remain essentially the same under the current plan. Preliminary details of the plan include making Maple and Jail streets one-way, plus new and revamped crosswalks, green spaces, and more parking. "So we're making a motion to approve this and to give them (Ringgold) our blessing," Chairman Steven Henry asked. "Yes," Patty replied. "It's a city project. Our county manager has coordinated with our constitutional officers who are the ones who live in the courthouse so to speak, and they are on board with doing this." Philip Schofield with CTI Engineers was at the meeting as well and said he's discussed the project with other people directly impacted. "We also talked with the sheriff's department, so they're agreeable as well with the design," Schofield said. "It's gone through several iterations with the City Council of Ringgold before we got to meet with the folks at the courthouse and the sheriff. Part of the project is on county property and part of it is in the right of way. It's a joint effort on agreeing on everything. Overall, Schofield said the plan would create approximately 16 more parking spots around the courthouse. Schofield added that the project came about following a study done a couple of years ago to help revitalize downtown. "There was a study by the Carl Vinson Institute and the Lyndhurst Foundation for the entire downtown area; kind of revitalization and beautification type of plan, and this is just a little piece of that plan that they came up with," Schofield said. The board unanimously approved moving forward with the plans. Commissioner Jeff Long also suggested that some signage be erected for courthouse staff parking. "It can get congested and fill up quickly there," Long said. Schofield affirmed that that issue had been discussed previously, and could be added to the plan. Adam Cook is a general assignment reporter and covers the Walker-Catoosa County area. He has been a reporter since 2009. He can be reached at The Catoosa County News office at 706-935-2621 and by email at acook@CatoosaNews.com. In January Catoosa County commissioners approved the purchase of a $480,000 home on East Nickajack Road to serve as the new Fire Station 2. Catoosa County has secured an agreement for architectural services related to construction modifications needed at its new Fire Station 2 site off Alabama Highway. During the Feb. 19 Board of Commissioner's meeting, County Attorney Clifton "Skip" Patty presented the contract proposal to the board and explained that the exact cost involved won't be known until construction is priced. "The proposed contract award is to Carter-Watkins Associates Inc. for architectural services related to the construction of apparatus bays and modifications to the existing structure that will eventually be fire station number two in the Woodstation area," Patty said. "The contract fee is six-percent of the construction cost estimated to run $24,000- $30,000 depending on scope of the construction bids at the time the bids are offered. It is a contract for the architect to provide all architectural services and contract services for the county in connection with renovation and construction of that project." The board unanimously approved the contract as presented and recommended by Patty. In January the board approved the purchase of a $480,000 home on 11 acres on East Nickajack Road to serve as the new fire station. The purchase was made after officials determined that expansion of the existing station was not possible. When the sale was approved, Chief Randy Camp stated that the $480,000 price tag was cheaper than building a new station from scratch with the only real catch being that modifications would need to be made to the home including the construction of some type off garage with bay doors to accommodate fire vehicles. After the purchase of the home at an $480,000 clip, the cost for the garage portion is estimated to coming in at around $400,000 or less. Location also played a big role in the decision to buy the home, as Camp explained that the house's proximity to the existing station would allow residents to keep their current ISO ratings. "We cannot move the fire station more than four-tenths of a mile in any direction," Camp explained on Jan. 15. "If we do that, we'll throw some of our citizens over the five road miles. Catoosa County has four ISO ratings. The citizens over the five road miles would go from a class 3 to a class 10. That class 10 means no fire protection, which means fire insurance rates would be extremely high. That strategic location of the Nickajack fire station...it's imperative that it stays in that vicinity." In addition to the approval of the architectural services contract, the board made and offsetting move by terminating the previous architectural contract related to old station. This is a contract termination with KCP Architects for architectural services related to fire station number two, which is at the old location," Patty said. "Enough preliminary work was done in connection with that to determine that the soils were not suitable for the construction of what we wanted and needed to construct there for a fully-manned fire station. The resolution is to terminate the contract with KCP Architects." Maddie Smith creates pieces of artwork and sells them for 50 cents each to raise money to help her brother, Levi, who suffers from Duchenne Muscular Dystrophy. Levi Smith lives with Duchenne Muscular Dystrophy and receives weekly infusions of a drug recently approved by the FDA to slow the progression of DMD. 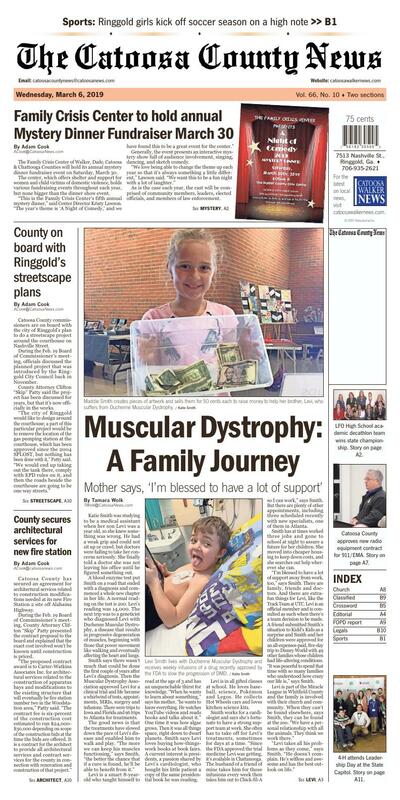 Katie Smith and her children, Maddie and Levi, are traveling the road of Levi's muscular dystrophy journey together. Katie Smith was studying to be a medical assistant when her son Levi was a year old, so she knew something was wrong. He had a weak grip and could not sit up or crawl, but doctors were failing to take her concerns seriously. She finally told a doctor she was not leaving his office until he figured something out. A blood enzyme test put Smith on a road that ended with a diagnosis and commenced a whole new chapter in her life. A normal reading on the test is 200. Levi's reading was 14,000. The next trip was to a geneticist who diagnosed Levi with Duchenne Muscular Dystrophy, a disease that results in progressive degeneration of muscles, beginning with those that power movement like walking and eventually affecting the heart and lungs. Smith says there wasn't much that could be done the first couple of years after Levi's diagnosis. Then the Muscular Dystrophy Association approved Levi for a clinical trial and life became a whirlwind of tests, appointments, MRIs, surgery and infusions. There were trips to Iowa and Florida and 96 trips to Atlanta for treatments. The good news is that the treatments have slowed down the pace of Levi's disease and enabled him to walk and play. "The more we can keep his muscles functioning," says Smith, "the better the chance that if a cure is found, he'll be able to benefit from it." Levi is a smart 8-yearold who taught himself to read at the age of 3 and has an unquenchable thirst for knowledge. "When he wants to learn about something," says his mother, "he wants to know everything. He watches YouTube videos and reads books and talks about it." One time it was how algae grows. Then it was all things space, right down to dwarf planets. Smith says Levi loves buying how-things-work books at book fairs. A current interest is presidents, a passion shared by Levi's cardiologist, who bought his little patient a copy of the same presidential book he was reading. Levi is in all gifted classes at school. He loves baseball, science, Pokemon and Legos. He collects Hot Wheels cars and loves kitchen science kits. Smith works for a cardiologist and says she's fortunate to have a strong support team at work. She often has to take off for Levi's treatments, sometimes for days at a time. "Since the FDA approved the trial medicine Levi was getting, it's available in Chattanooga. The husband of a friend of mine takes him for those infusions every week then takes him out to Chick-fil-A so I can work," says Smith. But there are plenty of other appointments, including three scheduled recently with new specialists, one of them in Atlanta. Smith has at times worked three jobs and gone to school at night to assure a future for her children. She moved into cheaper housing to keep down costs, and she searches out help wherever she can. "I'm blessed to have a lot of support away from work, too," says Smith. There are family, friends and doctors. And there are extra-fun things for Levi, like the Track Team at UTC. Levi is an official member and is consulted as such when there's a team decision to be made. A friend submitted Smith's situation to Kidd's Kids as a surprise and Smith and her children were approved for an all-expenses-paid, five-day trip to Disney World with 49 other families whose children had life-altering conditions. "It was peaceful to spend that time with so many families who understood how crazy our life is," says Smith. Levi is part of the Miracle League in Whitfield County and the family is involved with their church and community. When they can't be found elsewhere, says Smith, they can be found at the zoo. "We have a personal relationship with all the animals. They think we work there." "Levi takes all his problems as they come," says Smith. "He doesn't complain. He's selfless and awesome and has the best outlook on life." It's important to Smith to teach her children to help others. Levi and his 10-yearold sister Maddie happily help their church fill boxes with food and hand them out. Maddie creates art and sells it to help with things her brother and family need. Levi needed an iPad for school, which Maddie helped raise money for, and she's selling her work to give toward the house Catoosa County Habitat for Humanity is building for the family. Maddie's first act of giving occurred when she was four and heard a teacher talking about how her husband had lost his job and she wasn't sure how her family would afford Christmas. "She came home talking about it," says Smith, "and pretty soon she was calling relatives and even other kids and asking for donations." With Maddie leading the way, the Smiths made sure the teacher's family had a good Christmas. Maddie also gives her art away to child oncology patients when she accompanies her brother on his trips for infusions. When she sells her art, says Smith, she prices it at an affordable 50 cents apiece to make sure anyone who wants some can manage it. Since the family has been approved for a Habitat for Humanity home, they have been helping with another one that is under construction, painting and contributing in any way they can. Smith worries that Maddie too often must take a back seat to Levi's needs. "But she never complains," she says. Still, Smith looks forward to the day Maddie and Levi can each have their own bedroom. The road ahead for Levi and his family is long. A year from now, they should be in their new Habitat for Humanity House, but Smith is realistic, facing the fact that the house needs to be handicap accessible. Levi recently had a birthday. "When you're the mom of a terminally ill child," says Smith, "birthdays are hard. Looking back on Levi's perfect day both breaks my heart and makes me want to praise God for this journey of strength and bravery. I hate what my son has to go through and I wish I could save him, but I love who he is and how he teaches me." While there is no cure for DMD, progress has been made in treating it and those who have it are increasingly living beyond their teens, going to college and marrying. Smith says Levi must be constantly monitored and the drugs he takes will change over time to fit his needs. In the meantime, she says her family is living as fully as possible and trusting God to show them the way and make them a blessing to others as others bless them.